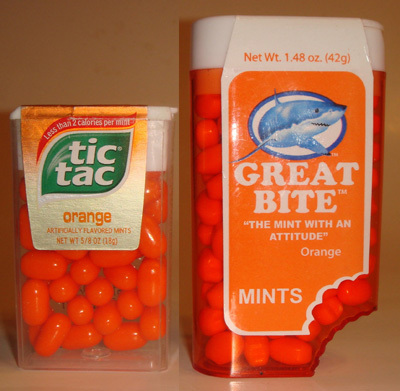 I haven’t seen “Great Bites” around here, but I would buy them if I did, if only for that cool/stupid packaging with the “bite” taken out of it. My favorite orange candies, BTW, are slightly chalky ones that taste like the St. Joseph’s Children’s Aspirin my mother used to give us when we were kids, back in the days before giving kids aspirin for fevers was considered some kind of pediatric Russian Roulette. I tried some Great Bite mints, each one of those has bite taken out of them too… so cute!